Intercellular communication via gap junctions allows cells within multicellular organisms to share small molecules. The effect of such interactions has been elucidated using mouse gene knockout strategies. Although several mutations in human gap junction-encoding connexin (Cx) have been described, Cx mutants in mice do not always recapitulate the human disease. Among the 20 mouse Cxs, Cx26, Cx43, and Cx45 play roles in early cardiac or placental development, and disruption of the genes results in lethality that hampers further analyses. Embryonic stem cells (ESCs) that lack Cx43 or Cx45 have made analysis feasible in both in vitro differentiated cell cultures and in vivo chimeric tissues. The success of mouse ESCs studies is leading to the use of induced pluripotent stem cells to learn more about the pathogenesis of human Cx diseases. This review summarizes the current status of mouse Cx disruption models and ESC differentiation studies, and discusses their implication for understanding human Cx diseases. Core tip: Numerous gap junction-encoding connexin (Cx) mutant mice have been established as models of human diseases. Although these analyses have facilitated current understanding of native Cx functions and the pathogenesis of related diseases, care must be taken when extrapolating findings from mice to humans, and vice versa, because there can be striking diversity in tissue organization and Cx expression patterns between these species. Recently, the use of human induced pluripotent stem cells (iPSCs) allowed further direct approaches for studying human diseases. According to the studies using mutant mouse embryonic stem cells, Cx mutant human iPSCs may become a useful model. Gap junctions consist of arrays of intercellular channels between adjacent cells. The channels are formed by the head-to-head docking of hexameric hemichannels called connexons, whose subunit proteins are encoded by the connexin (Cx) gene family in mammals (Table 1)[1,2]. Most cell types communicate with each other via gap junctions, which require cell-cell contacts, to maintain their homeostasis. This is likely a critical mode of communication in multicellular animals because Cx expression is highly conserved. In contrast, intercellular communication is performed via membrane-lined channels called plasmodesmata in plants and fungi. Unique combinations of Cx isoforms are expressed in each animal tissue, thereby regulating cell-type specific homeostasis. A classical experiment revealed that trophoblasts in the blastocyst are linked by gap junctions to other trophoblasts, as well as to cells in the inner cell mass, in preimplantation embryos; those cells that are linked by gap junctions to both trophoblasts and cells in the inner cell mass cells probably form the polar trophectoderm[5,6]. However, shortly after implantation the intercellular communication between trophoblasts and inner cell mass cells is lost. Another typical example occurs in the cardiac conduction system. In ventricular cardiac myocytes (CM), Cx43 is the main gap junction protein, whereas Cx40 expression predominates within the core conduction system. Although Cx43 and Cx40 both have high conductance, Cx45 forms low conductance and voltage-sensitive gap junctions between the ventricular CM and the core conduction system[1,8,9]. It is believed that this expression pattern effectively insulates the conduction system while also maintaining proper contacts between the conductive and ventricular CM. Table 1 Connexin knockout studies and human diseases. Mouse gene Mouse KO phenotypes Human disease Ref. 2About 60% (Cx31) and 30% (Cx31.1) of the embryos were lost in utero; the surviving adult mice were observed to have no morphological defects. Approximately 20 Cx isoforms have been reported in mice and humans. They are expressed in most tissues at varying levels and stoichiometry. One gap junction is composed of two hexameric connexons: 12 Cxs form a single channel. Many types of Cxs can be assembled into one connexon. Because a single cell usually expresses multiple Cx isoforms, theoretically there can be a plethora of different gap junction channels between cells, each with unique properties. Recent in vivo studies elucidated how the expression of a multitude of Cxs results in specific biological functions using mouse mutagenesis, as well as the molecular cloning of Cx mutations related to human diseases. Cx gene knockout (KO) strategies in mice were first applied to Cx43 by Reaume et al in 1995. Subsequently, mouse mutants have been reported for all of the Cxs, except for Cx23 and Cx33 (Table 1). Some Cx-KO strains show specific abnormalities. For example, Cx37 forms a unique gap junction between oocytes and granulosa cells in mice. Accordingly, Cx37-KO mice show impaired oocyte development and female infertility. Cx45 is thought to confer unique characteristics on peristaltic contractions in the early developing heart. Therefore, Cx45-KO embryos show lethality that is caused by a conduction block in early cardiogenesis[12,13]. The placenta is dependent on Cx26, Cx31, and Cx31.1, and each KO strain shows placental dysmorphogenesis[14-16]. Similarly, the lens epithelium co-expresses Cx46 and Cx50, and both Cx46-KO and Cx50-KO mice experience cataracts[17-19]. Cx46 and Cx50 have a redundant role in lens development, but individual roles in overall growth. Specifically, the targeted replacement of Cx50 with Cx46 prevented cataracts, but did not restore microphthalmia, which was apparent only in the Cx50-KO mice. Thus, a specific individual Cx does not seem to possess one-to-one association with a unique cell type in vivo. Instead, most cells express multiple Cxs to maintain intercellular communication. This might partly explain why the lack of two Cxs results in phenotypes that were not present in each individual KO[21-29]. In the heart, CMs express Cx30, Cx30.2, Cx40, Cx43, Cx45, and Cx46, and their expression is regulated both temporally and regionally[30-33]. Each Cx-KO strain exhibits developmental and electrophysiological abnormalities that are closely related to their expression patterns and channel properties (Table 1). As a result, three Cx-KO strains are shown to be lethal: Cx26-KO mice with defective transplacental glucose uptake, Cx43-KO mice with cardiac malformation, and Cx45-KO mice with blocked conduction in early cardiogenesis. Because these constitutive KO mice are embryonically lethal, other approaches are required to obtain insights into the role of these Cxs in adult tissues. Mouse Cx mutants do not always exhibit the same phenotype as would be expected from human Cx diseases (Table 1). The most divergent one is probably that of the placenta, whose structure is highly variable among mammalian species. The mouse feto-maternal barrier consists of three trophoblast layers (two syncytiotrophoblastic and one cytotrophoblastic layers), whereas that of humans has two (one syncytiotrophoblastic and one cytotrophoblastic layer). Moreover, the Cx isoforms expressed in the placenta differ among species. These structural and expression differences are probably a reason why placental defects are prevalent in Cx mutant mice. Accordingly, KO of the human deafness and skin disease-associated genes Cx26 and Cx31, together with Cx31.1, which is not a known human disease-related gene, causes placental dysfunction. Because of the striking diversity in Cx expression in placental structures, care must be taken when extrapolating findings from one species to another. The lethality of Cx26-KO mice was overcome using Cre/loxP technology to create tissue-specific Cx26-KO mice. For example, knocking out Cx26 in the mouse inner ear epithelium caused cell death in the cochlear epithelial network and sensory hair cells, which greatly enhanced our understanding of the pathogenesis of deafness. Cx37-KO mice show complete female infertility. Although this finding provides an important insight into oogenesis, no human diseases that cause female infertility have been linked to Cx37. Cx32 is the causative gene of human X-linked Charcot-Marie-Tooth disease[36,37]. Although Cx32-KO mice exhibit peripheral neuropathy similar to that observed with the abovementioned disease, they also show liver dysfunction, which has not been described in humans[38-40]. Generally, interspecies differences in Cx expression and organogenesis make loss-of-function phenotypes somewhat divergent. In addition, minor phenotypes in Cx-KO mice might not yet have been described as symptoms of human diseases. In contrast, the major spatio-temporal expression patterns of Cxs in the heart appear to be relatively conserved among mammalian species. A detailed comparison of the expression of Cx40, Cx43, and Cx45 in developing mouse and human hearts indicated that their expression paralleled one another. Although no null mutations have been reported in human Cx40, Cx43, and Cx45, the loss of Cx40 blocked atrioventricular conduction and caused a high incidence of cardiac malformations in mice. Cx43-KO mice exhibited neonatal lethality due to cardiac malformation; Cx45-KO mice experienced a lethal conduction block in early cardiogenesis[10,12,23,42-45]. It is possible that null mutations in human Cx40, Cx43, and Cx45 exist, but that the development of the fetus could be aborted. However, several missense mutations in Cx40 and Cx43 have been described in human heart diseases, and attempts have been made to create mice with the Cx43 missense mutations related to oculodentodigital dysplasia in humans (Table 1)[46,47]. 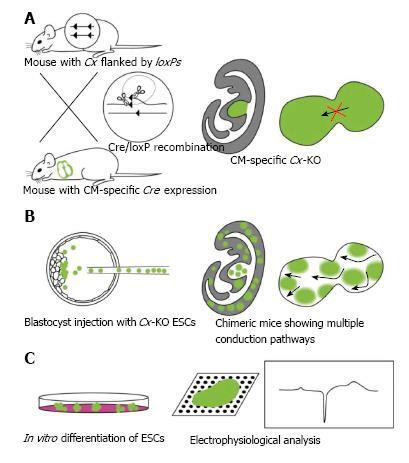 In addition to CM with missense mutations, adult mice with Cx-KOs are required to understand why or how Cx30, Cx30.2, Cx40, Cx43, Cx45, and Cx46 are expressed differentially in the heart and also to extrapolate human Cx functions from mouse studies. Adult CM cannot be obtained from lethal Cx43-KO and Cx45-KO mice. Therefore, attempts have been made to mutate a unique Cx isoform in a tissue-specific manner. A widely accepted approach to circumvent the lethality of constitutive KOs is the tissue-specific deletion of a gene using Cre/loxP technology (Figure 1). In this method, the target gene is flanked by loxP sequences, and the tissue-specific expression of Cre recombinase deletes the gene of interest. The embryonic lethal genes Cx26, Cx43, and Cx45 have all been analyzed using this method. They were all deleted specifically in adult tissues, for example in the inner ear epithelium, CM, and neurons[13,35,48-51]. The use of ESCs lacking Cx43 or Cx45 has advantages in addition to those afforded by Cre/loxP technology (Figure 1)[52,53]. The CM-specific deletion of Cx43 slowed conduction and caused sudden arrhythmic death. Similarly, the CM-specific deletion of Cx45 was embryonic lethal, similar to constitutive Cx45-KO mice. In both these examples, Cre recombinase was used to delete the genes in most of the CM. Because Cx is a gap junction protein, understanding what happens at the borders between Cx-positive and -negative cells has been of great interest. Chimeric mice, which are formed from mutant ESCs and recipient blastocysts, allow these experiments to be performed. Mouse ESCs express Cx31, Cx43, and Cx45 proteins. Cx43-KO ESCs were used to form chimeric tissues with wild-type cells, and the chimeric heart showed conduction defects and diminished cardiac performance. This study supports the concept that tissue mosaicism in different Cx isoforms might be responsible for reentrant arrhythmias. Indeed, in humans, atrial tissue genetic mosaicism in a loss-of-function Cx43 mutation was reported to be associated with sporadic lone atrial fibrillation. Cx43 chimeric mice form a model of atrial fibrillation, which might facilitate the development of therapeutic approaches for modifying the function of cardiac gap junctions. Research using ESCs that lack Cx45 developed very differently from those lacking Cx43. Cx45-KO ESCs cannot be integrated into chimeras, because they never mix with the inner cell mass of the recipient. Innate Cx45 is expressed abundantly in early embryos, suggesting that it might play a role in cell adhesiveness during early development. Irrespective of their incompatibility with chimera production, Cx45-KO ESCs differentiate into the three germ layers in vitro. CMs induced from Cx45-KO ESCs showed conduction abnormalities. Constitutive Cx45-KO mice were reported initially by two laboratories independently[12,44]. One group reported heart abnormalities, whereas the other focused on vascular abnormalities. Later, as described above, the CM-specific Cx45-KO mice were shown to be similar to the constitutive Cx45-KO mice. Taken together, the heart abnormalities are expected to be the primary defect associated with the loss of Cx45 in developing embryos. Induced pluripotent stem cells (iPSCs) have similar potential to ESCs, and can differentiate into many cell types including germ cells[56,57]. Importantly, iPSCs can be derived from adult somatic cells, including from individuals with genetic diseases. Human iPSCs from patients might provide unlimited supplies of specific tissues, and the use of human cells is more important than creating mouse genetic models for the understanding of human diseases. Theoretically, chimeric human tissue formed from diseased and normal iPSCs could be generated in vitro. As studies performed using mouse ESCs indicate, this approach might be particularly useful for studying human junction proteins including Cxs. Even minor tissues such as endocrine cells can be supplied in unlimited amounts in rare diseases, and biological specimens of uniform quality will improve reproducibility greatly, which is often problematic in human studies. The future of iPSC technology also seems very promising in mouse studies because iPSCs can be derived from many mouse genetic models. For example, attempts have been made to improve disease conditions by the transplantation of tissues differentiated in vitro. The transplanted tissues were derived from autologous iPSCs in which the specific genetic disorder had been corrected. Although establishing iPSCs with multiple targeted mutations might require breeding different mutant mice, this is likely far easier than performing multiple gene targeting using ESCs. Therefore, the use of iPSCs might allow the unique and redundant contributions of Cxs in intercellular communication to be elucidated further. Cx mutant mouse strategies have revealed detailed in vivo functions of intercellular communication carried out by individual Cx species. The use of Cx mutant ESCs and iPSCs has additional advantages. Especially, iPSCs can be obtained from individuals with genetic diseases. Analysis of chimeric and in vitro differentiated tissues is useful for understanding the molecular target in human Cx diseases. To date, some reagents are known to modulate gap junctional intercellular communication and are used in clinical trials for the treatment of wound, arrhythmia, migraine, and cancer[61-66]. Reproducibility in the stem cell-based experimental systems will be a great advantage for the development of such therapeutic drugs.